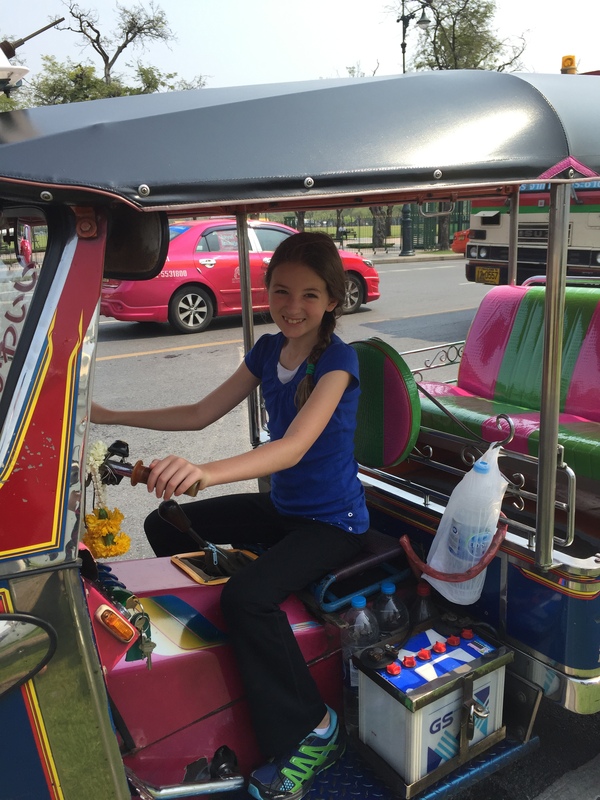 We arrived in Bangkok around midnight and immediately met one of our favorite guides on our trip, Kitty. (Thai surnames can be very long so Kitty chose this name to use when working with tourists) We checked into our apartment/hotel called the Chatrium where we were right on the river. It was a two bedroom apartment and our view was overlooking an international school. It was fun to hear the kid’s voices in the morning and see them playing outside and enjoying their physical education classes which included swimming in a beautiful pool. We also had a really nice pool and Lilli and Bella were thrilled to see it as we checked out the breakfast buffet at the hotel. The breakfast buffet was extravagant and consisted of every type of egg, yogurt, fruit, baked goods, cereal, juices, etc… you could imagine. We ate well there! It was warm in Bangkok so we enjoyed swimming in the enormous pool a few times and played water tag while overlooking the river—Jared and I even got a few laps in. We enjoyed walking around Bangkok at night (Cue: “One Night in Bangkok” by Murray Head) and the wide sidewalks in many areas of the city. Taking the river taxi to Asiatique generated some cooler breezes and landed us in the middle of a huge complex of restaurants and shops a few minutes ride from out hotel. It was an outdoor mall with shops and restaurants that ranged from different types of food including some really good Thai food, ice cream stores, clothing, and lots of souvenirs. It was here that Lilli decided to get her first exfoliating fish pedicure—she gently inserted her feet into a clear fish tank full of tiny fish that quickly swam over to nibble at her toes and feet. Bella was supposed to get a fish pedicure too but screamed every time the fish got close to her feet and eventually just pulled her piggies out for good. Bella is a budding chef and has been enjoying creating concoctions for us – and I believe this all started in Thailand. Bella is whipping up some chicken satay and Massaman curry for us in this photo. We LOVED the food there and tried many new things and really liked all of them. Even Lilli liked the food there for the most part and she is generally a devoted pastatarian (one who only eats pasta). 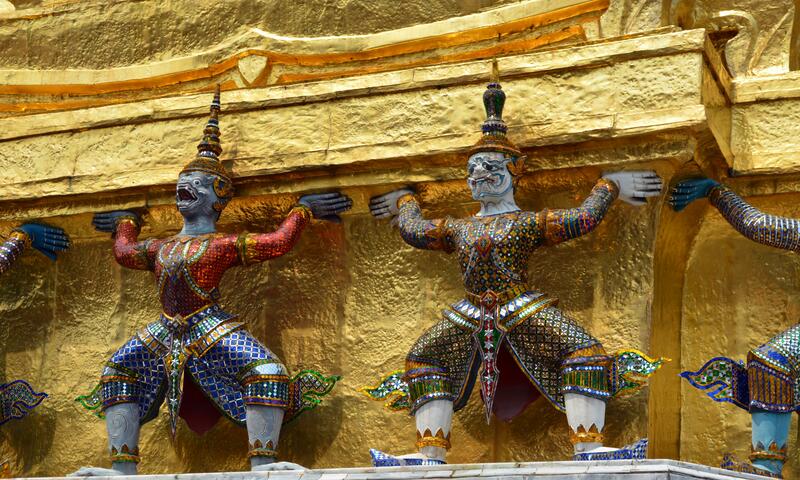 When in Bangkok, there is one “must-do” and that is to go and fight the hordes of tourists at the Grand Palace. Bus after bus lets off t masses of people to view the splendor of the Palace so we were elbow to elbow with other tourists and their selfie sticks throughout the property. In addition to high temps, high humidity, and full sun—to make the experience a little more interesting—this has temples so it is considered a holy place which means you have to dress “properly”. Why must the places in some of the hottest places in the world have these rules and make everyone swelter wearing long pants and long sleeves??? If Adam and Eve had only behaved themselves maybe we wouldn’t have all of the various religions thinking that arms and legs must be covered up in a church or temple. In any case, the palace is where the King and his family have lived and worked for hundreds of years. 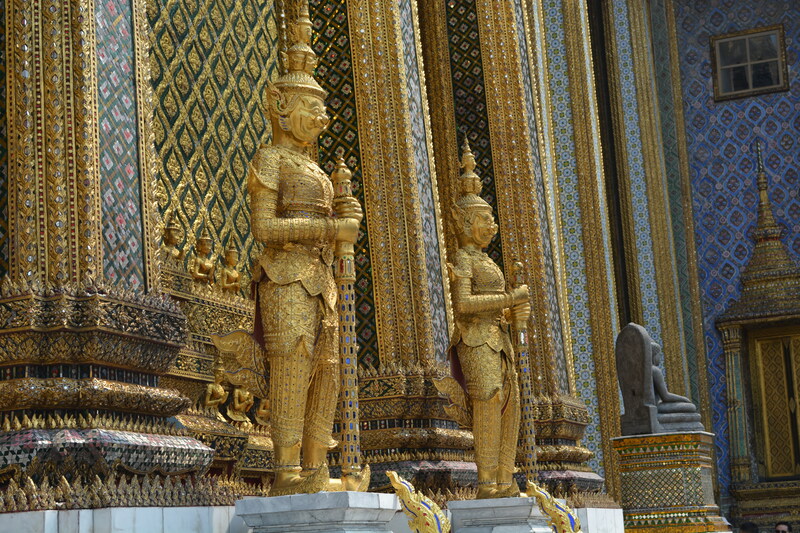 The huge, multi-storied, gold-plated buildings are dazzling and very extravagant. And to make it more over the top, one of the temples is home to one of the most revered Buddha statues, the Emerald Buddha. The mines in Thailand have been consistently churning out gold and precious minerals for hundreds of years and they have certainly put them to use in a grand manner. 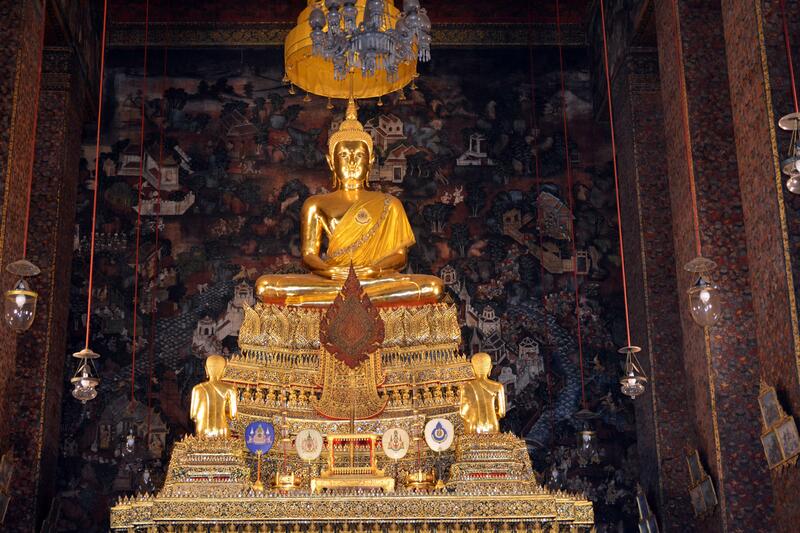 Next is the famous Wat Pho or Reclining Buddha. This is literally a Buddha statue that is laying on its side and measures at least 150 feet long and 20 feet high. 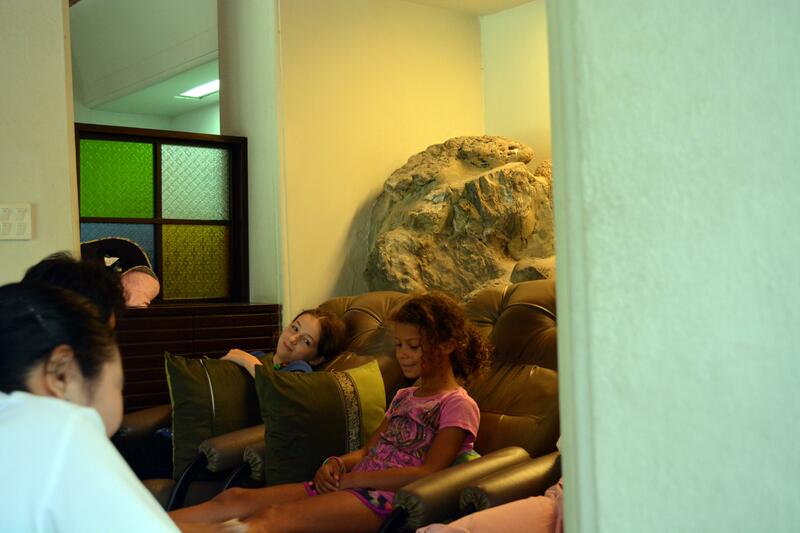 The girls were mildly impressed, but what made their day was the foot massage that followed. Wat Pho is also considered to be the birthplace of Thai Massage and all four of us mostly enjoyed our foot massages at the School of Massage–it was sometimes painful but mostly relaxing and felt good in the end. We took a longboat to tour the river and many back canals, which is very similar to the boats we rode in along the Rio Madre de Dio in Peru. The wooden hull was long and narrow with a long shaft attached to an open air Chevy V6 engine with a propeller attached at the end–loud and effective! The long boat took us down the main channel off the We went to a puppet show at the Joe Louis School of puppetry, which was really different than any other puppet show we have seen—it consisted of very ornate puppets which were worked by three people at once. The puppeteers dressed in all black and wore a special mask that was custom fitted to their faces. After watching the show for a while, the puppeteers faded into the background and the puppet became the focal point—coming to life under their expert guidance. 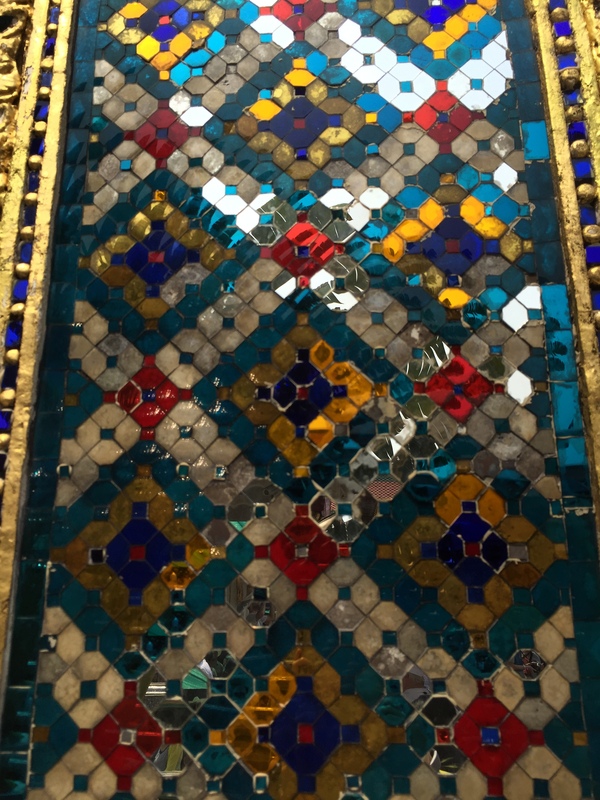 One of the unexpected favorites in Bangkok was the Museum Siam. We have found that as a family do not have a lot of patience for museums, except for Jared who wants to read every single detail and we usually have drag him out. This museum was the exception and had adults and kids in mind as it told the story of how Thailand went from East to West crossroads in the 15th century to choosing between communism and capitalism in the mid-20th century. There were a lot of interactive exhibits and they went in a lot of depth about culture—how people lived in the various time periods, what they ate, what they wore, and what they did. It was a fun experience and several hours there went very quickly. 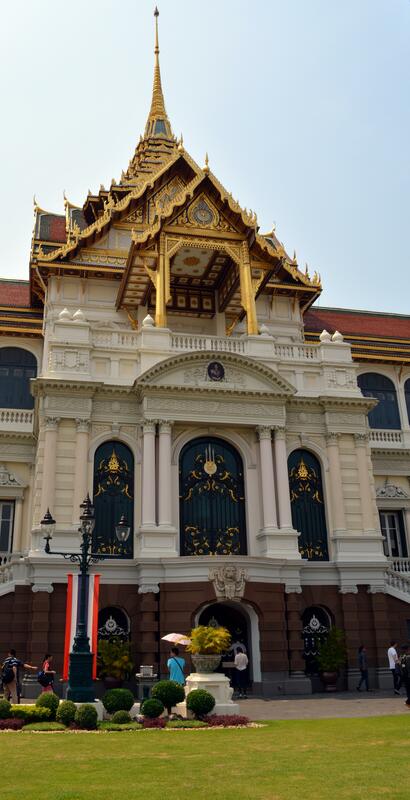 We think we spent about the right amount of time for a tourist in Bangkok, 2-3 days. We may have actually spent more time in the airport as we crossed through Suvarnabhumi (say that one fast three times!) Airport several times in the next few weeks as you’ll see in our next couple postings. 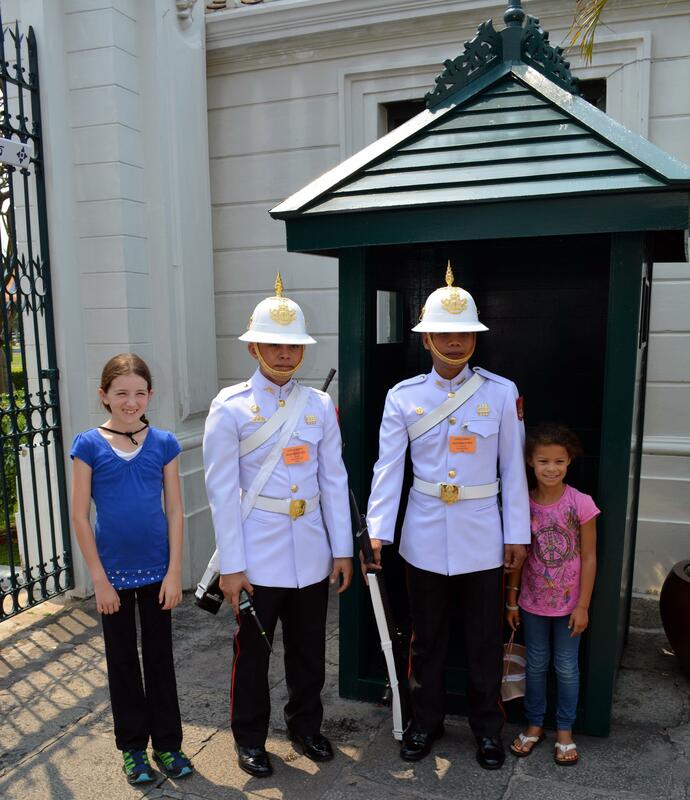 We loved Thailand–from south to north and off to the islands. 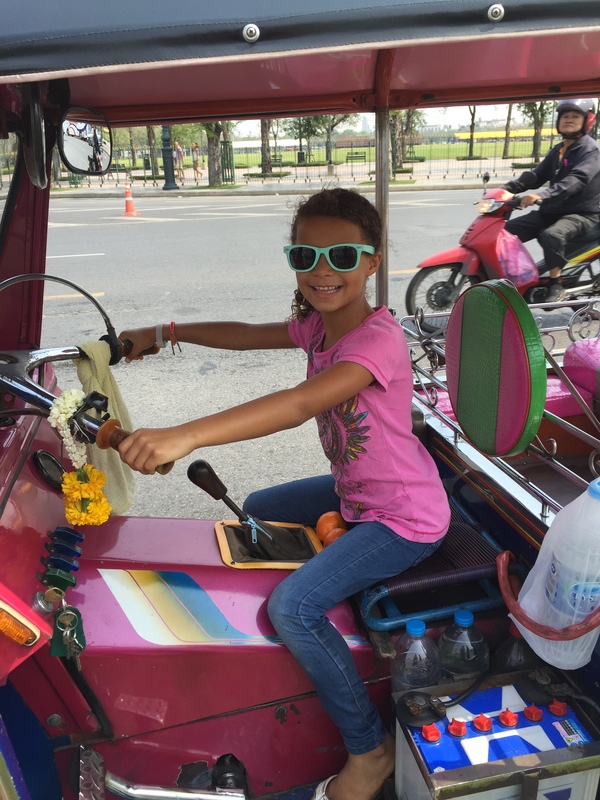 We had a really amazing time there–Chiang Mai was one of our favorite places of the entire trip. Read all about it in our next entry. Amazing Journey!! Amazing Pics!! Keep the updates coming! !